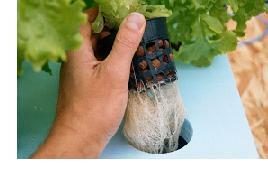 Here is one easy way how to grow hydro lettuce. 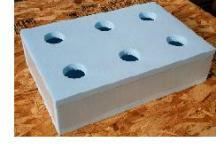 The hydroponic gardening system pictured here is made out of 1 inch thick blue insulation foam, available at Lowes and Home Depot. 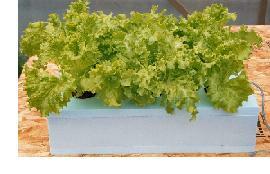 Each 2' X 8' sheet can make two hydroponic systems as pictured. The foam is cut using a long bladed utility knife, to make the edges square and clean. 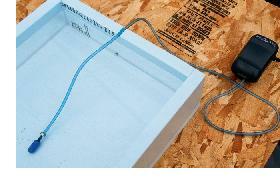 The tank is put together using a low temperature glue gun (important). Each finished system will be 16 inches wide, 24 inches long, and 4 inches deep. 3 inch holes for the netted pots are cut in the top, and the top simply sits on the rest of the system without being glued. As you can see from the diagram, the nutrient solution is kept at a level that keeps the bottom 1/2 inch of each pot submerged. An aquarium air pump is used to keep the nutrient solution well aerated. Nutrients are only absorbed (by the roots of your plants) in the presence of Oxygen. If you have problems with it floating around, a stainless steel nut can be placed on the air line. Lettuce in this system should be fed a vegetative formula at about half strength (vegetative nutrients will have more Nitrogen than Phosphorus or Potassium). If you are using Maxsea, that would be 2 level teaspoons per gallon....which comes out to about 700 ppm on a TDS meter. Don't forget to also add 1/2 teaspoon of Epsom salts per gallon if your fertilizer is Magnesium deficient (which is the case with Maxsea). As you can see, the lettuce above grows healthy and green, and the roots below are healthy and white. Always keep light off of the nutrient solution to prevent algae growth! This is one of the most convenient ways I have found how to grow hydro lettuce.